NEWARK — Henrik Lundqvist managed to keep his cool the entire season, but as the games have run out and the wins have dried up for him, his frustration has started to show. 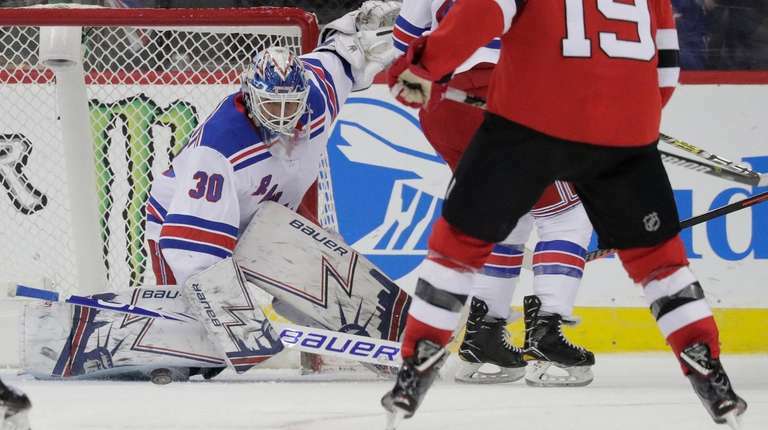 Lundqvist made 37 saves Monday, but the Rangers lost to the Devils, 4-2, at Prudential Center, ending the team’s modest winning streak at two games. With three games remaining in the regular season, Lundqvist, who doesn’t know how many of those games he’ll play, is stuck on 18 wins, meaning there’s a chance he won’t win 20 games for the first time in his 14 NHL seasons. “It’s been a tough stretch,’’ he said, acknowledging that it’s hard to stay sharp when he’s playing so irregularly. Rookie Alexandar Georgiev, 23, is playing more than Lundqvist these days as the Rangers try to get younger players quality ice time to set them up for success next season. And Georgiev is playing well. He made 44 saves Friday to help the Rangers beat St. Louis, then earned his second shutout of the season in Sunday’s 3-0 win in Philadelphia. “He’s getting a lot of minutes right now, and deserves it,’’ Lundqvist said. “For me, every time you come in there, it’s a different feeling, for sure. I’ve just got to work that much harder to get that comfortable game feeling that I’m used to having, playing every second day, and you’re in it. And now you feel ‘off.’ But that’s the reality now, and I’ve just got to adjust to that down the stretch here. Coach David Quinn said before the game that Lundqvist would play one of the final three, but he wavered after the game and said he might give him two starts. The Rangers play Wednesday at home against the woeful Ottawa Senators, then finish the season with a back-to-back on Friday at home against the Blue Jackets and Saturday in Pittsburgh. The Devils led 2-0 on goals by Miles Wood at 3:54 of the first period and Travis Zajac on a power play at 14:34 of the first. Brett Howden got the Rangers on the board at 18:40 of the period and Chris Kreider appeared to tie it with 1:06 remaining, but video review showed his backhander banked off the post, landed on the goal line and was cleared by Devils defenseman Damon Severson. The Rangers tied it in a fight-filled second period, when Filip Chytil banged in the rebound of Vinni Lettieri’s shot on a power play at 16:36 for his 11th goal. But Connor Carrick’s first goal as a Devil, with 4:10 left in regulation, put the Devils in front and Joey Anderson scored an empty-netter. Notes & quotes: Chytil took a hit at the end of the game, but Quinn didn’t have an update . . . Pavel Buchnevich, who collided with the Flyers’ Nolan Patrick late in Sunday’s game, was a late scratch. Quinn said he might play Wednesday . . . Brendan Lemieux, who was scratched Sunday, returned to the lineup and beat up Wood in one of the three fights in the second period. Tony DeAngelo (vs. Nathan Bastian) and Lias Andersson (vs. Blake Coleman) were the other two fights.